SAMSUNG EVO Plus 128GB MicroSD Micro SDXC C10 Flash Memory Card w/ SD Adapter. Condition is New. Shipped with USPS First Class Package. 1 x 128GB SDXC card with SD Adapter. Optimal speed and performance for SDXC compatible devices. Class 10 speed (based on SD 2.00 specification). FREE SD Adapter is included. Holds countless amounts of data, music, video, images etc. 100% Real. Do not buy fakes, you will lose your files! Excellent deal! Item has described. a 5 ( 25. CARD IS LEGIT!! Excellent condition! j 1 ( 127. ). Form Factot : microSDXC. 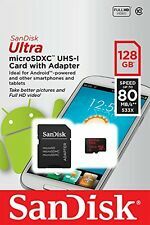 SANDISK ULTRA microSD UHS-I CARD. Storage Capacity: 128GB. Micro SD (SDHC and SDXC). SD (SDHC and SDXC). Mini SD (SDHC and SDXC). Product Manufacturer: SanDisk. Product Type: MicroSDXC. Manufacturer Part Number: SDSQUNS-128G. Compatibilidad: caja negra para smartphone / tableta / coche, etc. Samsung EVO MB-MC128DA/AM Plus 128gb Micro SD Card With Adapter. Condition is New. Shipped with USPS First Class Package. Capacity: 128GB. 1x SanDisk Black Adapter. Class A1 C10 for Full HD video recording and playback. All weather water/temperature/shock/magnet/X-ray proof. Trending at $23.50eBay determines this price through a machine learned model of the product's sale prices within the last 90 days. Best Price, Service, & Fastest Shipping!! !